This entry was posted in Hannah Herndon and tagged "How High the Moon", Almena Lomax, Ella Fitzgerald, jazz, scatting by herndon. Bookmark the permalink. 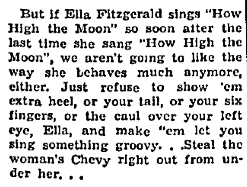 This post is a slam dunk, and not just because the 1960 recording of “How High the Moon” is my favorite Fitzgerald performance of all time. I like how you engage critically with Lomax’s attack on Fitzgerald, although I’m not sure I agree that the 1960 performance would have changed Lomax’s views very much. After all, Fitzgerald is still trotting out gratuitous virtuosity for the pleasure of a (majority white, German) audience who expect that of her. Granted, the virtuosity goes above and beyond anything they may have seen before – you call it defiant, I might call it aggressive – but it’s hard to draw the line between virtuosic-for-self and virtuosic-for-audience. I absolutely buy your characterization of some of her scatting as anti-beautiful, though, and I suspect there’s more to say about the various allusions and quotations in this performance. One quick comment on that is that her quote of “Ornithology” is actually a return volley of Parker’s composition of “Ornithology” as a contrafact on “How High the Moon,” which is the earlier of the two pieces. It became common practice for performers of both songs to quote the other song in their solos.